← A Vita-Mix Evening of Fun! How is this to store? Does it retain the same consistency, and does it stay for a week? I would assume the best receptacle is glass, but what did you use? It stores beautifully. I kept it in the refrigerator in a glass jar for several weeks. It retained its consistency. I like it warm over pancakes, waffles or ice cream so I heated it in the microwave for a few seconds before pouring. Lovely photo and great presentation. I like how it tells a story. This syrup looks beautiful and sounds delicious. These are, hands down, the most delicious looking pancakes I have ever seen! I love the food photography on your site. The images are really stunning. Thanks for your kind words, Chris. We’ve only had the blog up for about a week now, but we’re hoping the photography will help set us apart from other food blogs. This recipe sounds delicious to someone like me who loves sweets and blueberries. The picture of the pancakes is making my mouth water and I just finished eating. Best wishes on your new blog and keep the recipes and pictures coming. This looks so good, I am going to have to make it this week. I’m drooling. 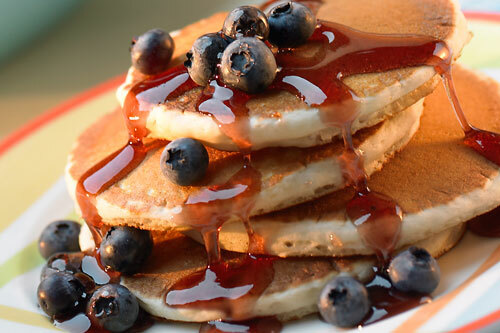 You can use the Vita-Mix to make a very smooth, uncooked blueberry syrup to add to your blueberry syrup dreams! We’ll try that next time we get together and serve over ice cream as a side to the birthday cake! The Vita-Mix is a must!! I am going to have to try the uncooked blueberry syrup.